When we say a bib is CLASSIC FIT, we mean it is meant to fit snug, but comfortable. When we say a bib is SLIM FIT, we again mean that it’s snug to the body, but this time we’re using higher compression fabrics and construction methods to give you a racier, more pro fit. When we say a bib is SLEEK FIT, we mean it is optimized for aerodynamics and has the high-compression fabrics, patterns, and details that we use in clothing for world-class professional athletes. REDUX bibs are SLEEK fit and optimized for aerodynamics. Expect a very snug fit that is going to feel too small when you first put them on, but absolutely ideal when you’re motoring along at your fastest. We made REDUX bibs for high-performance training and racing. Equipped with our lightweight, ultra-distance C3 padding, REDUX bibs are great for competitive gran fondos, centuries, epic challenge rides, all-day training rides, Ironman triathlons, etc. GENIO bibs are SLIM fit. Longer in the leg than our other bibs and tailored to be highly aerodynamic, GENIO bibs are made with Fitter fabric, which gives a very high-compression feel. We made GENIO bibs for high-performance training and racing. Equipped with our lightweight, ultra-distance C3 padding (the seatpad so comfortable it’s used Trek Segafredo for Grand Tour racing), GENIO bibs are great for all-day training rides, Granfondo’s, Centuries, etc. SLEEK99 bib shorts are tight-fitting, mid-compression performance bibs for training and racing. We used Thunderbike Power, a powerful fabric that actually reduces muscle stress thanks to its slightly compressive effect. SLEEK99 bib shorts are designed for racing and performance training. They’re built around our most-popular and durable all-around, Gel Intech Evolution (GITevo), with Twist gel core for incredible performance even over long distances (up to six-hour rides). TONO bibs are constructed from state-of-the-art Thunderbike Power and New Monica fabrics with minimal seams and include a revolutionary design with honeycomb silicon grip on the inside of the shorts preferred over an elasticated finish. This all results in a tight, secure fit (SLIM fit), but not too constricting feel evenly across your hips and thighs. For racing and high-volume training, especially in hotter climates. TONO includes the NAT chamois, our lightweight NEXT technology silicone-gel based seatpad. The NEXT silicone insert has unique perforations with ridged edges that allow heat and moisture to escape while reducing friction. Which means NAT is an ideal distance pad and even better for hot-weather riding. MAGO bibs are designed for comfort. CLASSIC fit, they’re snug, but not too tight. The Revolution fabric is lightweight and breathable, with light compression. MAGO is our best-value bib, an affordable performance option with an elevated chamois. NAT paddings feature the NEXT silicone wedge has unique perforations with ridged edges that allow heat and moisture to escape as well and reduce friction in the saddle. Which means NAT is an ideal distance pad. Made with durable, mid-compression Thunderbike Power fabric, SCATTO bib shorts are our perfect all-around training bib. CLASSIC fit, they feel snug when worn, but not overly tight (a Goldilocks fit - not overly aero, not too relaxed; just right). Beehive silicone leg-gripping fabric locks the bibs in place while riding, and mesh braces provide ventilation. SCATTO bibs come with our Gel Intech Evolution (GiTEvo) padding, the latest iteration of our best-selling and most popular Twist-Gel chamois. We’ve been using Twist Gel cores for almost two decades. They provide terrific value – durable and suitable for long rides. Use SCATTO for long group rides, all-day adventures, even racing, as your core, everyday bib. IMPACT bib shorts are special. We’ve sewn in a panel of ballistic-grade anti-rip Impact fabric at the hips (produced by Italian fabric-supplier Sitip and reinforced with Dyneema fibres - the world’s strongest material - 15 times stronger than steel). IMPACT bibs are CLASSIC fit, which means they are snug but not tight for comfort and durability. Designed to give you a performance bib short with the added comfort of knowing it will protect your skin from road rash. IMPACT bibs come with our ultra-distance C3 padding, with ergonomic 3D surface and sculpted gel core. The C3 seatpad is so comfortable it’s the exact same one that Trek Segafredo uses in Grand Tour racing. 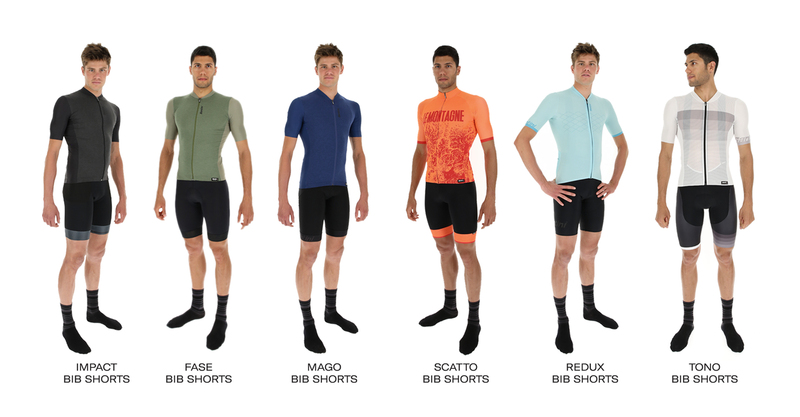 "Italian performance at entry-level pricing"
FASE bibs and shorts are CLASSIC fit; snug, but not too tight. Made from elastic and soft Papaya fabric, we want them to feel like a major upgrade from the first economy bib you bought when you started riding, an opportunity to try Italian-made fabrics and the Santini approach to cycling clothing, but at a reachable cost. For all-around cycling. FASE bibs and shorts come with our eMAX padding, an engineered, 3D-molded, multi-density foam-core pad that’s as good as or better than the chamois in bibs with much higher price tags. Perfect for group rides, shorter races, intense trainer sessions or cycle classes.